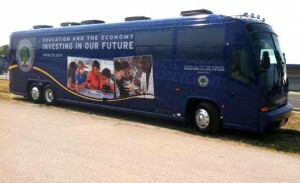 Yesterday I had the opportunity to be part of Secretary of Education Arne Duncan’s Welcome Back to School Education Bus Tour 2011. Probably the greatest part of the day was that I spent it traveling with Indiana’s Superintendent of Public Instruction, Dr. Tony Bennett and his Press Secretary, Alex Demron. Now, before you react because of politics notice I am being bipartisan here and including lessons learned from both political parties. In fact my favorite Dr. Bennett quote of the day was, “Kids don’t come to us with R’s and D’s stamped on their heads.” In fact let’s just call that Lesson #1. I would like to share four other lessons I learned from my day yesterday with these great leaders. First of all I have to start by telling you that traveling with an elected official might be one of the most rigorous and invigorating things you can do. We literally went from event to event to event to event, and on and on. I even ended up doing some interviews as well. Pretty cool stuff when I stopped and thought about all of the great things that were happening in education reform. The first observation I want to share is that I have never met a leader so consistent in what he believes and how he delivers that message as Dr. Bennett. This is a leadership characteristic that we all can learn from. He is so passionate and has researched the subjects of his vision and strategy so much that no matter what question is asked of him the message is always the same. Effective leaders push the boundaries and transform vision into meaningful and hopeful strategy. One topic in Secretary Duncan’s speech really jumped out at me having spent time this past June in China. He talked about, with vivid examples, of how our students now complete globally for both jobs and college acceptance. This was obvious to me as one of the Tuesday’s that I was in China 10 million students were taking the university entrance exam. I was told that less that half would make the cut and less than 20% would be able to go to China’s universities because of space. If I do the math correctly that leaves about 4 million top Chinese students to compete with U.S. students for top spots in our colleges and universities. Secretary Duncan recognizes this disparity and is working hard to devise solutions. I am a huge believer in all of the things that make for a functioning learning organization. David Garvin said that a learning organization was, “an organization skilled at creating, acquiring, interpreting, transferring, and retaining knowledge, and at purposefully modifying its behavior to reflect new knowledge and insights.” In order for this to happen their must be inquiry and even discourse. These tough conversations are where lessons are learned. This includes being blunt and totally transparent. As Dr. Bennett said yesterday, “We may disagree on issues, but as we have the tough discussion we will come up with a great solution both can agree on.” It is evident that both Secretary Duncan and State Superintendent Bennett are willing to have the tough conversations. I hope we all can learn from the examples set by these two great leaders. I believe history will speak favorably of the comprehensive education reform being implemented through the leadership they are exhibiting. Even though Dr. Bennett has an R stamped on him and Secretary Duncan has a D stamped on him they are working in bipartisan concert to “Put Students First.” Remember, as they do – Kid’s don’t have R’s and D’s Stamped on their heads! « You Want Me To Do What? Teach? Bennett is consistent with his message because he refuses to listen to any dissent. That’s not leadership, that’s fascism-lite. There is perceptibly a lot to realize about this. I suppose you made some nice points in features also.